Ox cheeks are another massively underrated cut of meat. A good butcher will order you in some (they don’t get the beast’s head anymore). Generally muscles that do the most amount of work have the most amount of flavour but are tougher as a result of all the work they do, hence why a Beef fillet is very tender but low on flavour in comparison to say, a Rib Eye. The cheeks need long, slow cooking so all that delicious flavour just melts in your mouth and it creates an unctuous gravy. This is another really lazy recipe that lets the slow cooker do all the work. I get quite a few Ox cheeks in at a time and freeze them. 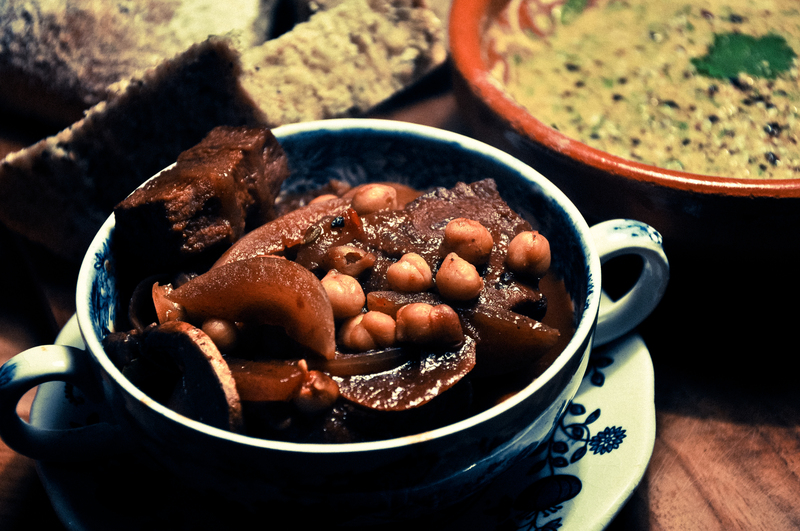 I find that if I put the frozen cheeks in the slow cooker then the onions and chickpeas still retain their bite despite the long cooking time, which is perfect, so I have written the recipe down exactly as I did it. You can always use fresh ox cheeks dredged in seasoned flour and fry them (and the onions if you like) before you pop them in the slow cooker but I prefer the way that entails the least amount of washing up! Just throw it all in your slow cooker in the morning and by dinner time the ox cheeks will be meltingly gorgeous and the sweet, smoky gravy will be divine! If just before serving you want your gravy more concentrated just ladle out some of the liquid into a pan, reduce to intensify then pop back in the slow cooker. Just, mix everything together in a bowl and you are done! I usually sprinkle the top of the dip with some of my homemade Super Dukkah (recipe also features in the January issue of Great Food Magazine) to give a bit of crunch. All the quantities can be varied to suit your taste and what dish its accompanying, no rules just make what tastes good to you really.